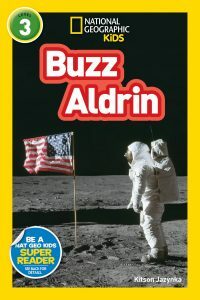 Blast off and experience humankind’s first steps on the moon in this new biography about Buzz Aldrin. You’ll learn about astronaut Aldrin’s life — his childhood, his work on NASA’s Apollo 11 mission, and his dream to get humans to Mars. This biography tells a true hero’s story. In addition to running text about his remarkable life and achievements, readers will find fun facts, quotes from Aldrin, and lots of amazing photographs. It’s sure to captivate kids interested in history, famous people, and space exploration. National Geographic Readers’ expert-vetted text, along with brilliant images and a fun approach to reading have proved to be a winning formula with kids, parents and educators. Level 3 text provides accessible yet wide-ranging information for kids reading on their own. Each reader includes text written by an experienced, skilled children’s book author, a photo glossary, and interactive features in which kids get to reinforce what they’ve learned in the book. This biography is timed to release in advance of the 50th anniversary of Apollo 11 and Buzz Aldrin’s historic expedition.